For two years my wife and I had been trying for a baby. We had genuinely started to think that we would never achieve it when suddenly we got that positive result that we’d been hoping and praying for for so long. Those were the happiest three days of my life and yet they were followed by so many of the worst. We lost that first baby and, having believed we weren’t going to conceive, now thought we were certainly never going to have children. I thank God that within a few months of that we did conceive again. Terrified that the same thing would happen again we were on edge for the next nine months but thankfully that pregnancy ended at full term and we now have a son. Sadly however, that wasn’t the end of it for us. We managed to conceive again in 2013 but, one week before the first scan, lost the baby. Having gone through it before, having had a son as well, did not prepare us for this happening again. It still hurt just as much and it was only with the support of good doctors, nurses and organisations such as the Miscarriage Association that we were able to get through it again. We are now eagerly awaiting the birth of our second child later this year. Out of four pregnancies we are looking at two full-term. 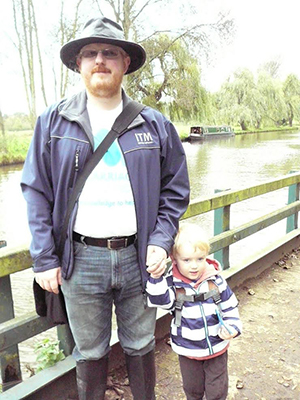 My son Seth and I have begun a yearly walk to raise funds for the Miscarriage Association and to remember the two losses. The first time Seth came along on my back however, now that he is bigger, we will both be walking from Guildford to Shalford along the River Wey.